There maybe many social media flatforms in knowing what’s happening in the world but admittedly, Twitter provides the faster, data-friendly and more accessible when it comes to mobile web experience. This month, Twitter, Globe and Smart joins hand in hand to provide daily entertainment updates to over 120 Million Mobile Phone Subscribers in the Philippines. The three giants promised a daily entertainment updates via Twitter Lite to help Filipinos stay updated on what’s happening with their favorite Pinoy idols and be part of the global conversation. 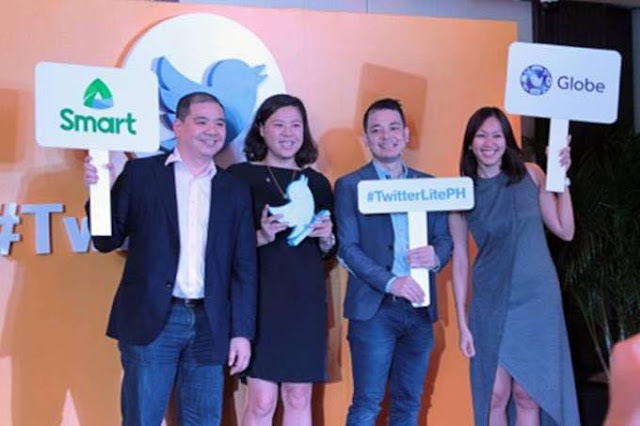 The partnership with Globe Telecom and Smart Communications will extend the benefits of Twitter Lite to over 120 million mobile subscribers in the Philippines, including those living in outlying islands and rural areas. Globe will be promoting Twitter Lite through a custom Twitter timeline t.co/GlobeEntertainment and Twitter data pack through SMS marketing and USSD menu browser to their subscribers. Smart will offer a custom Twitter timeline t.co/SmartEntertainment and Twitter data pack through SMS marketing to their subscribers, as well as expose Twitter Lite on the Opera browser speed dial. Twitter Lite provides a faster, data-friendly and more accessible mobile web experience for Filipinos across the country. Through Progressive Web App technology, Twitter Lite allows up to 70% data saving, 30% faster launch time, and takes up less than 1 MB memory on mobile devices. Those on Twitter Lite will also enjoy app-like performance such as a wide range of push notifications and offline support without the need for an App Store or Google Play account. The latest version of Twitter Lite adds Poll creation and safety features to block, mute and report, alongside other key features of Twitter on the mobile web experience. Twitter Lite is available at mobile.twitter.com — on smartphone or tablet in 42 languages including Tagalog. Both partners will also be doing roadshows across the country to support promoting Twitter Lite. Globe and Smart subscribers will receive an SMS alert with a link to the special curated timeline on Twitter Lite to get live updates on Entertainment in the Philippines. Users can enable data saver mode on Twitter Lite to enjoy real-time Entertainment content in an affordable manner at any time and reduce their data usage by up to 70%. In this mode, users will see a preview of images and videos before choosing which ones to fully load. On the Android platform, there’s no fear of missing out as you can get push notifications to what’s happening in your Twitter network or what people are talking about in local and global sports and entertainment scene. Even when you temporarily lose connectivity, Twitter Lite will offer offline support, so you will never be interrupted while enjoying the latest teleseryes updates in the specially curated Twitter timeline. To easily access the custom Entertainment timeline on Twitter Lite, follow the prompt to add Twitter Lite to your phone’s home screen to quickly launch the app with just one tap. For those who have the native app already installed with faster devices and connection speeds, you can easily move from the web experience to the native app.